The semipalmated plover (Charadrius semipalmatus) is a small plover. The genus name Charadrius is a Late Latin word for a yellowish bird mentioned in the fourth-century Vulgate. It derives from Ancient Greek kharadrios a bird found in ravines and river valleys (kharadra, "ravine"). The specific semipalmatus is Latin and comes from semi, "half" and palma, "palm". Like the English name, this refers to its only partly webbed feet. This species weighs 22–63 g (0.78–2.22 oz) and measures 14–20 cm (5.5–7.9 in) in length and 35–56 cm (14–22 in) across the wings. Adults have a grey-brown back and wings, a white belly, and a white breast with one black neckband. They have a brown cap, a white forehead, a black mask around the eyes and a short orange and black bill. They are migratory and winter in coastal areas of the southern United States, the Caribbean and much of South America. They are extremely rare vagrants to western Europe, and have been found in Tierra del Fuego and the Isles of Scilly. Their true status may be obscured by the difficulty in identifying them from the very similar ringed plover of Eurasia, of which it was formerly considered a subspecies. Semipalmated plovers forage for food on beaches, tidal flats and fields, usually by sight. They eat insects, crustaceans and worms. This bird resembles the killdeer but is much smaller and has only one band. Since the semipalmated plover nests on the ground, it uses a "broken-wing" display to lure intruders away from the nest, in a display similar to the related killdeer. ^ BirdLife International (2012). "Charadrius semipalmatus". IUCN Red List of Threatened Species. Version 2013.2. International Union for Conservation of Nature. Retrieved 26 November 2013. ^ Jobling, James A (2010). The Helm Dictionary of Scientific Bird Names. London: Christopher Helm. pp. 99, 353. ISBN 978-1-4081-2501-4. ^ Kaufman, Kenn. (2000) Kaufman Field Guide to Birds of North America. New York: Houghton-Mifflin. 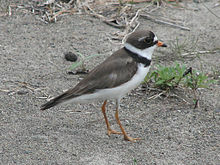 Wikimedia Commons has media related to Semipalmated plover. "Semipalmated plover media". Internet Bird Collection. This page was last edited on 19 June 2018, at 21:22 (UTC).